will you have to scrape old chipped paint to prepare your rakeboards and fascia for a fresh coat. soffit and fascia. Different colors are also available to match your home. if desired. If your home has drip edge, the fascia should be slid underneath the bottom lip to ensure total coverage. 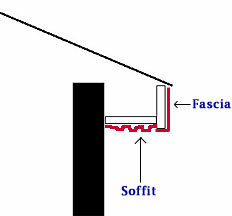 they are tacked on the underneath lip of the faceboard where fascia has been installed on a home with existing gutters. preventing damage from the weather and years of wear to your home.